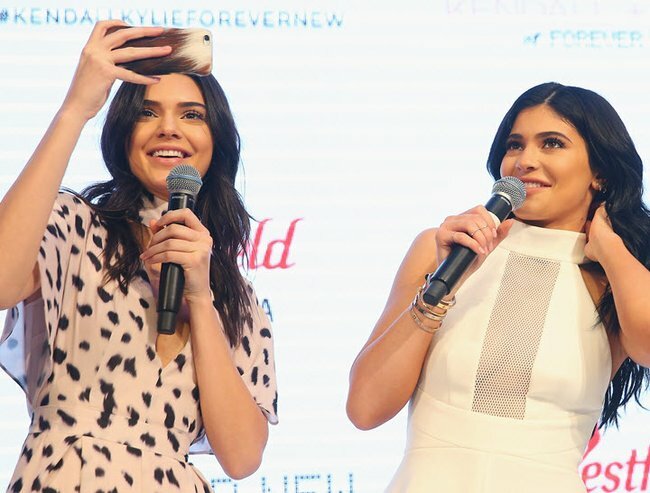 Kendall and Kylie Jenner are in Sydney and their social diary is FULL, guys. In case you didn’t pick up the vibrations from their vocal fry, the youngest scions of the Kardashian/Jenner empire have reached Australian shores. Kylie Jenner, 18, and her supermodel sister Kendall, 20, are in town to promote their new range of clothing with local fast fashion store Forever New. They’ve only been here a day but they’ve already pissed off magazine editors, had eggs hurled at them and taken the requisite 7,000 Harbour Bridge selfies. Kylie Jenner discovers the Sydney Harbour Bridge. Image via Instagram. The first item on their Sydney schedule was to host a luncheon for local media at a Rose Bay eatery yesterday. According to the Sydney Morning Herald, editors of glossy fashion mags such as Harper’s Bazaar, Elle and Marie Claire were instructed not to take pictures of the girls at table. Said editors complied, begrudgingly, because they are very important too — but mostly because the girls were a no-show for more than 90 minutes. Ain’t nobody got time for that, particularly not Jackie Frank, the editor of Marie Claire who is a notorious whirl of activity. She left the restaurant before the Jenner sisters deigned to arrive. The closest she got to the mega-famous Jenners was a David Bromley portrait of the sisters smiling smugly from the wall. When the girls did finally arrive by boat, it was totally worth it, because they made insightful remarks and proved themselves to be utterly charming and delightful company. Like this opening gambit from Kendall: “I love Australia and we’ve heard such great things and we have such amazing fans in Australia so I think that we really wanted to do something here,” she said, speaking about the fast fashion range. “Ditto,” her sister told the assembled editors, reports the SMH. Less sunning, more lunching, ladies! Image via Instagram. Proving they’ve really done their research for this, their first trip downunder, Kylie then displaying her wide local knowledge. She deduced Sydney is indeed the setting for Finding Nemo, posting a picture of herself beneath the bridge with the caption, “P Sherman 42 Wallaby Way Sydney”. She liked it so much she recorded herself saying it again while her make-up was being done. Following the lunch, the girls travelled out to one of our crowning monuments, Parramatta Westfield, for a guest appearance. In a display of bad manners and really poor hospitality a 25-year-old woman was arrested at the shopping center for hurling eggs and tomatoes at the immaculately groomed sisters. Fortunately, not a skerrick of yolk marred their outfits, though security guards armed with umbrellas were on-hand. Westfield selfies. Note the umbrella. Image via Getty. Kendall Jenner has become one of the world’s most wanted models, fronting campaigns for Balmain and Fendi and is fresh off the Victoria’s Secret runway. Meanwhile, her sister Kylie has been named one of the world’s most influential teens by virtue of her social media prowess, which sees her posting videos such as the one below to the delight of tens of millions of people. The girls are next headed to Melbourne for more promotional appearances. Stay tuned.